The Yin and Yan symbol is a visual depiction of the intertwined duality of all things in nature, a common theme in Taoism. Taoism (modernly: Daoism) is a philosophical and religious tradition that emphasizes living in harmony with the Tao (modernly romanized as "Dao"). The term Tao means "way", "path" or "principle", and can also be found in Chinese philosophies and religions other than Taoism. In Taoism, however, Tao denotes something that is both the source and the driving force behind everything that exists. It is ultimately ineffable: "The Tao that can be told is not the eternal Tao." The keystone work of literature in Taoism is the Tao Te Ching, a concise and ambiguous book containing teachings attributed to Chinese philosopher Laozi. Together with the writings of Zhuangzi, these texts build the philosophical foundation of Taoism. Both Zhuangzi and Laozi were opposed to the Confucian insistence on pushing individuals into particular roles, therefore forcing social and political harmony. For those who identified as Taoists, this interrupted the flow of nature. Instead, people, especially rulers, should just be. In this way, natural order would be established. The Taoist concept of wuwei, non-action, expresses a confidence in the natural flow and order of life by urging rulers to refrain from establishing rules and categories - as the Confucians would have rulers do. This philosophical Taoism, individualistic by nature, is not institutionalized. Institutionalized forms, however, evolved over time in the shape of a number of different schools, often integrating beliefs and practices that even pre-dated the keystone texts – as, for example, the theories of the School of Naturalists, which synthesized the concepts of yin-yang and the Five Elements. Taoist schools traditionally feature reverence for Laozi, immortals or ancestors, along with a variety of divination and exorcism rituals, and practices for achieving ecstasy, longevity or immortality. Taoist propriety and ethics may vary depending on the particular school, but in general tends to emphasize wu-wei (action through non-action), "naturalness", simplicity, spontaneity, and the Three Treasures: compassion, moderation, and humility. Taoism has had profound influence on Chinese culture in the course of the centuries, and clerics of institutionalised Taoism (Chinese: 道士; pinyin: dàoshi) usually take care to note distinction between their ritual tradition and the customs and practices found in Chinese folk religion as these distinctions sometimes appear blurred. Chinese alchemy (especially neidan), Chinese astrology, Zen Buddhism, several martial arts, Traditional Chinese medicine, feng shui, and many styles of qigong have been intertwined with Taoism throughout history. Beyond China, Taoism also had influence on surrounding societies in Asia. After Laozi and Zhuangzi the literature of Taoism grew steadily and used to be compiled in form of a canon – the Daozang, which was at times published at the behest of the emperor. Throughout Chinese history, Taoism was several times nominated as state religion. After the 17th century, however, it fell much from favor. Like all other religious activity, Taoism was suppressed in the first decades of the People's Republic of China (and even persecuted during the Cultural Revolution), but continued to be practised in Taiwan. Today, it is one of five religions recognized in the PRC, and although it does not travel readily from its Asian roots, claims adherents in a number of societies. Lao-tzu or Laozi (老子; also romanized as Lao Tse, Lao Tu, Lao-Tsu, Laotze, Laosi, Laocius, and other variations) was a philosopher of ancient China, best known as the author of the Tao Te Ching (often simply referred to as Laozi). His name, Lao-tzu or Laozi is an honorific title. Lao (老) means "venerable" or "old." Zi (子), Wade-Giles transliteration tzu, in this context is typically translated "master". Zi was used in ancient China as an honorific suffix, indicating "Master", or "Sir." Thus, the name Lao-tzu is the equivalent to "the Old or Venerable Philosopher." In popular biographies, Laozi's given name was Er, his surname was Li (forming Li Er, 李耳) and his courtesy name was Boyang. Dan is a posthumous name given to Laozi, and he is sometimes referred to as Li Dan (李聃). As with other similar figures, there remains a significant amount of disagreement between Chinese tradition and historical evidence. Tradition holds that Lao-tzu lived in the 6th century BCE, while historians are more likely to argue he lived between the 5th and 4th centuries BCE, or that he is actually a synthesis of multiple figures, or was entirely mythical. Numerous popular legends regarding his origins have been handed down through the centuries. The earliest reliable reference to Laozi is found in the Records of the Grand Historian (Shiji) by Chinese historian Sima Qian (ca. 145-86 BCE). In it, Lao-tzu is mentioned three times. In the two, he was said to be a contemporary of Confucius (551-479 BCE), who wrote a book in several parts. In the third, he was identified as the Grand Historian and astrologer Lao Dan (老聃 "Old Long-ears"), who lived during the reign of Duke Xiàn (384-362 BCE) of the Qin dynasty. According to popular traditional biographies, Lao-tzu was a scholar who worked as the Keeper of the Archives for the royal court of Zhou. This reportedly allowed him broad access to the works of the Yellow Emperor and other classics of the time. The stories assert that Lao-tzu never opened a formal school, but he nonetheless attracted a large number of students and loyal disciples. There are numerous variations of a story depicting Confucius consulting Lao-tzu about rituals. By the mid-twentieth century, a consensus emerged among scholars that the historicity of Lao-tzu was doubtful or unprovable and that the Tao Te Ching is "a compilation of Taoist sayings by many hands." The oldest known text of the Tao Te Ching that has been excavated was written on bamboo tablets and dates back to the late 4th century BCE. The Tao Te Ching, or Daodejing, is traditionally regarded as the work of Lao-tzu, though the identity of its author(s) and/or compiler(s) has been debated throughout history. The Tao Te Ching is one of the most significant treatises in Chinese cosmogony, in other words, the philosophical study of the origin and nature of the universe. It describes the Tao (or Dao) as the source and ideal of all existence: it is unseen, but not transcendent, immensely powerful yet supremely humble, being the root of all things. Humans have no special place within the Tao, being just one of its many ("ten thousand") manifestations. Still, people do have desires and free will (and thus are able to alter their own nature). Many act "unnaturally", upsetting the natural balance of the Tao. The Tao Te Ching's goal is to lead students to a "return" to their natural state, in harmony with the Tao. 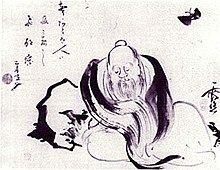 Zhuangzi(庄子) was an influential Chinese philosopher who lived around the 4th century BCE during the Warring States Period, a period corresponding to the philosophical summit of Chinese thought — the Hundred Schools of Thought, and is credited with writing—in part or in whole—a work known by his name, the Zhuangzi. His name Zhuangzi (English "Master Zhuang", with Zi being an honorific) is sometimes spelled Zhuang Tze, Zhuang Zhou, Chuang Tsu, Chuang Tzu, Chouang-Dsi, Chuang Tse, or Chuangtze. Zhuangzi is traditionally credited as the author of at least part of the work bearing his name, the Zhuangzi. This work, in its current shape consisting of 33 chapters, is traditionally divided into three parts: the first part, known as the "Inner Chapters", consists of the first seven essays; the second, known as the "Outer Chapters", consist of the next 15 essays; the last, known as the "Mixed Chapters", consist of the remaining 11 essays. The meaning of these three names is disputed: according to Guo Xiang', the "Inner Chapters" were written by Zhuangzi, the "Outer Chapters" written by his disciples, and the "Mixed Chapters" by other hands; the other interpretation is that the names refer to the origin of the titles of the chapters—the "Inner Chapters" take their titles from phrases inside the chapter, the "Outer Chapters" from the opening words of the chapters, and the "Mixed Chapters" from a mixture of these two sources. Further study of the text does not provide a clear choice between these alternatives. On the one side, as Sinologist Martin Palmer points out in the introduction to his translation, two of the three chapters Sima Qian cited in his biography of Zhuangzi, come from the "Outer Chapters" and the third from the "Mixed Chapters". "Neither of these are allowed as authentic Chuang Tzu chapters by certain purists, yet they breathe the very spirit of Chuang Tzu just as much as, for example, the famous 'butterfly passage' of chapter 2." On the other hand, chapter 33 has been often considered as intrusive, being a survey of the major movements during the "Hundred Schools of Thought" with an emphasis on the philosophy of Hui Shih. Further, A.C. Graham and other critics have subjected the text to a stylistic analysis and identified four strains of thought in the book: a) the ideas of Zhuangzi or his disciples; b) a "primitivist" strain of thinking similar to Laozi; c) a strain very strongly represented in chapters 8-11 which is attributed to the philosophy of Yang Chu; and d) a fourth strain which may be related to the philosophical school of Huang-Lao. In this spirit, Martin Palmer wrote that "trying to read Chuang Tzu sequentially is a mistake. The text is a collection, not a developing argument." Zhuangzi was renowned for his brilliant wordplay and use of parables to convey messages. His critiques of Confucian society and historical figures are humorous and at times ironic. In general, Zhuangzi's philosophy is skeptical, arguing that life is limited and knowledge to be gained is unlimited. To use the limited to pursue the unlimited, he said, was foolish. Our language and cognition in general presuppose a dao to which each of us is committed by our separate past—our paths. Consequently, we should be aware that our most carefully considered conclusions might seem misguided had we experienced a different past. Zhuangzi argues that in addition to experience, our natural dispositions are combined with acquired ones—including dispositions to use names of things, to approve/disapprove based on those names and to act in accordance to the embodied standards. Thinking about and choosing our next step down our dao or path is conditioned by this unique set of natural acquisitions. Zhuangzi's thought can also be considered a precursor of relativism in systems of value. His relativism even leads him to doubt the basis of pragmatic arguments (that a good course of action preserves our lives) since this presupposes that life is good and death bad. In the fourth section of "The Great Happiness" (至樂 zhìlè, chapter 18), Zhuangzi expresses pity to a skull he sees lying at the side of the road. Zhuangzi laments that the skull is now dead, but the skull retorts, "How do you know it's bad to be dead?" However, this subjectivism is balanced by a kind of sensitive holism in the famous section called "The Happiness of Fish" (魚之樂, yúzhīlè). The traditional interpretation of this "Daoist staple", writes Chad Hansen (2003:145), is a "humorous miscommunication between a mystic and a logician". The encounter also outlines part of the Daoist practice of observing and learning from the natural world. Zhuangzi dreaming of a butterfly (or a butterfly dreaming of Zhuangzi). Another well-known part of the book, which is also found in Chapter 2, is usually called "Zhuangzi dreamed he was a butterfly" (莊周夢蝶 Zhuāng Zhōu mèng dié). This passage hints at many questions in the philosophy of mind, philosophy of language, and epistemology. The name of the passage has become a common Chinese idiom, and has spread into Western languages as well. It appears, inter alia, as an illustration in Jorge Luis Borges' famous essay "A New Refutation of Time", and may have inspired H. P. Lovecraft's 1918 short story "Polaris". It also appears in Victor Pelevin's 1996 philosophical novel Buddha's Little Finger. Anarchism: Zhuangzi said the world "does not need governing; in fact it should not be governed," and, "Good order results spontaneously when things are let alone." American historian, Murray Rothbard, called him "perhaps the world's first anarchist". Evolution: In Chapter 18, Zhuangzi also mentions life forms have an innate ability or power (hua 化) to transform and adapt to their surroundings. Zhuangzi further mentioned that humans are also subject to this process as humans are a part of nature. This page was last edited on 9 September 2016, at 21:22.